Our many thanks again go to Rick Wolfe, who is once again sharing images from his extensive postcard collection–this time 1910-1940 postcards of early Minnesota health spas. Spas go back at least as far as the Greeks and Romans. Their baths incorporated natural hot springs and served as focal points for social and recreational activities. Later spas became associated with wellness resorts, emphasizing the health benefits of mineral springs and thermal water in relieving rheumatoid arthritis and osteoarthritis. Today the International Spa Association defines spas as “places devoted to enhancing overall well-being through a variety of professional services that encourage the renewal of mind, body and spirit.” This broad definition covers a great variety of nontraditional spas in the United States, including everything from hot stone massages to personal fitness, mixed with golf, tennis, swimming, and health foods. 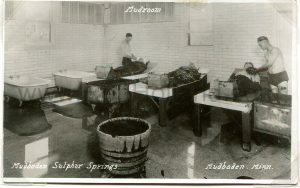 Three of the earliest Minnesota mineral health spas were located near Jordan and Shakopee, and included Mudbaden, Jordan Sulphur Springs, and Mudcura. These sites incorporated mud from the Minnesota River in their treatments. Two of the facilities remain, although are no longer used as health spas. You can view Rick’s spa postcards and learn more by playing the 3+ minute slide show below, or click here to view the individual spa images in Rick’s part of the “Shared Photos” section of this website (including his 800+ resort images). To read my past blog posts, click here, or click on any of the “Blog categories” listed to the right. You can also share this blog post on social media by clicking any icon below. This entry was posted in All blog entries, Minnesota Tourism, Readers' Stories. Bookmark the permalink. How interesting! Fun to see how old the pictures are. Great job, as usual! Buz and I love it!